Only showing entries about islands from Sustainable Travel. View entries about islands from all Travellerspoint blogs. Our Time in Fiji well spent. Screw those backpacker itineraries, flashpacker resorts and cruiseboats… man, we saw the real Fiji or better Viti. (Viti = Fiji in Fijian.) What it really is like living in Fiji and it couldn’t have been a better experience. What I didn’t know was that there is some hardship to be had by about 70 percent of the population. You got to work hard out there to live your sustainable life on a tropical island. The luxury resorts on numerous tiny islands away from the main island (which is Viti Levu = literal translation = big Fiji) and the main cities (especially Suva, the capital) are all a tourist really gets to see. Happy Fijians greeting you and helping you out with anything you need. Lovely service, although a tad on the slow side. Fiji Time is a common saying here, I guess also known as island time. Time doesn’t really exist here. Things happen when they happen, so you better leave your western mentality and expectations behind. What you don’t get to see, unless you go out explicitly in search of it, is the real village life. How most of the Fijians still live these days. They don’t really need electricity and are fine with not owning a fridge (which in my opinion I couldn’t do without). Their main resources are limited in variety, but I guess they also don’t really mind. Life revolves around food, so farming and fishing is the main activity besides preparing and cooking. Seems quite simple, doesn’t it. Well it is, but there’s a beauty in it, that I as a western girl wish I could appreciate more. I noticed first hand, by my own experiences that I get quite restless while staying in villages for too long. They don’t really use downtime for personal need. There’s no such thing as reading a book for leisure and maybe if you’re lucky there will be one household that owns a TV. Computers and internet are a city thing and most villagers don’t know what Facebook is. Oh my lord, I can hear you saying… it is in reality a third world country. Well... yes and no. Most people would label it as such but I think Fijians really don’t mind the kind of life they lead. They are not in need of anything else. This is what it has been like for a while now and it works so what’s wrong with that. Everything you do or work for is in service of the local community. Everything is a communal possession. A great example of this is how any house is everybody’s house. People walk in and out, chatting, gossiping and sharing responsibilities such as caring for the little ones. Babies are adored, really I can’t put it in any other way then they are conceived as little gods and goddesses. Constantly being kissed and paraded around, an average baby in your average village is not alone for a moment. The complete opposite of how western babies grow up. They can’t be taught how to be independent fast enough! Fijian babies are cuddled and loved and passed around frequently. Everybody is everybody’s mother, father, big brother or big sister. Seriously, it blew my mind.. Although the city life is definitely different. I speak mainly of my village experiences on Vanua Levu, Viti Levu and Taveuni. Unfortunately that’s all we had time and funds for. Thanks to a friend of my dad back home in Belgium we were able to hook up with a local family and their extended family spread all over the country. We visited several villages thanks to them and on our own we managed to integrate in some more as well. 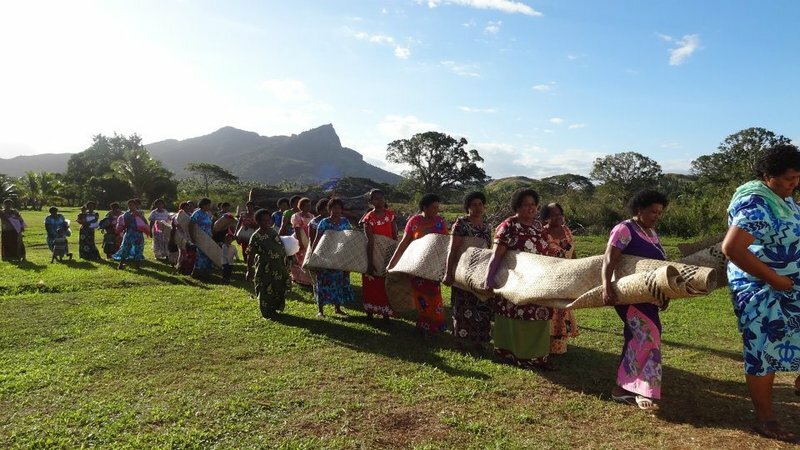 It is a fascinating culture with old traditions still embedded in their everyday life to this day but missionaries have definitely succeeded in religiously conquering and transforming Fiji though. There’s about 6 different branches of Christianity present everywhere we went plus Islam in the bigger places and Hinduism as well. I don’t think you can find an untouched village anymore regrettably. Even though the real Fijian food we had day in and day out, never disappointed us and is, if I may say so really yummy, there’s not much variation. As too be expected by being extremely isolated islands and it is a tropical climate after all. The main diet consists of Dalo (Taro), cassava and coconut. The coconut tree must be the most versatile around. They use every single part of it for cooking with, eating, body care products and building their houses and furniture, weaving hats, mats, baskets and fans with the palm leaves. There are a couple of green leaf vegetables, readily available and that made me happy but for the rest, unless it’s a village close to the sea and they get to fish every day, there is really not a lot to it. When you go visit people or a village, you bring them one of the following as gifts (Sevusevu) and they will be extremely grateful; canned fish or meat, cookies, sugar, bread, butter, soap and toilet paper. These are luxury items only available in shops and the cities. Wages are extremely low but I guess the cost of living is not that bad either, if you don’t buy beer and meat every day. The traditional Sevusevu would be or as they call it, Grog. Let’s have a little chat about Kava shall we? It is the original traditional drink for Fijians, pounded root of the peppershrub, mixed with water, it makes a muddy not so nice tasting drink. It’s their versions of drugs and alcohol (cause I haven’t really encountered anything else once off the beaten track). Granted you can find beer, wine, spirits and marijuana in the cities, but not as plentiful and besides Fiji Bitter or Gold (which is quite cheap) the rest is very expensive. Normal Fijians can’t afford alcohol so Kava it is. And trust me it is.. at all times and for any occasion possible the bowl comes out and the traditional half coconut shell used as a cup gets passed around. You better not be afraid of catching something when you go visit a village cause everything is made with the local water and food gets eaten with your hands and the kava bowl is shared. So once you get over the muddy numb-making taste of Kava, you might enjoy it and maybe after a couple of full cups you might feel a bit drunk, but it wears off extremely fast. So don’t get your hopes up. No, you haven’t found an cheap alternative to alcohol, forget about it. It makes you at best a bit woozy and very mellow. You will sleep great and the next day you might just want to do nothing and take another nap. On the other hand, I’ve heard Vanuatu has the strong and better stuff though. But I wouldn’t know myself as I haven’t tried it. Fijians are basically the most hospitable people I’ve met so far (I think it can be said about almost any Pacific Island nation). There is nothing they would not give to you, because you as a foreigner are really honoring them with your interest and your visit. They will invite you in, just cause you are passing by, for tea, lunch or dinner depending on what’s going on at that time. They will make a spot at the head of the table for you (that is the head of the tablecloth on the floor, there is no such thing as a table in real Fijian households.) They’ll give you the best piece of meat and will give their beds to you if you are invited to stay the night. You’ll be proudly guided around and invited in and you’ll be shaking (lululu = official greeting/meeting) a million hands (because they all want to meet the –as it was in our case – white people). We’ve had young kids be afraid of us, starting to cry (cause they have never seen a white person before in their lives). We’ve had to smack away some little hands trying to peek into our bedroom, prying the curtains to one side in the evenings. Kids just being gob smacked when looking for the second time when they realize we don’t really belong in their village. Being stared at was definitely a common occurrence. We had the occasional better educated and worldly young ones flock to us and ask us a million questions in English about traveling and what it is like outside of Fiji. It was fun and new for the first few days but after a while there’s that guilt sneaking it’s way in and you start to feel a bit inappropriate for many different reasons. I’m sure those are feelings many of us would feel in those kind of situations and I’m not sure if I’m comfortable feeling them all the time because of the way we travel. From now on, we’ll be heading only to poorer countries and we will keep on hanging out with the locals, so I guess I better get used to it. Fijians are very respectful people. Unless you’ve been living with them for months and been seen as one of their own, you will not be allowed to do much. Offering to do the dishes or your own laundry are not going to be allowed. They will tend to you and try to make you as comfortable as possible. Adults won’t really ask about your life or pry into your business unless they really feel close to you which takes some time. Romantic gestures or kissing or holding hands are NOT done and it is very hard to tell how they actually go about dating and getting to know one another. I guess it all happens in secrecy. In one of the villages we visited on Vanua Levu we got the experience a real Fijian style wedding. Four days of full on organization and celebration. Pigs and cows were slaughtered and the best ingredients were used for making delicious food! We had squid in lolo (coconut milk) and lime, clams and grilled fish. Lots of meat and chicken curries, plus all the different kinds of fried bread for breakfast the day after the wedding. It was amazing!!! Not only the food but the teamwork of the village on display. Let’s just say experiencing the real Fiji was a once in a lifetime thing and that I’m very satisfied with our choice of travel methods. I can go in search of the perfect beach and lazy around in Indonesia for a lot less money and that’s exactly what I’m planning on doing. I’m glad I went for an off the beaten track kind of experience in Fiji. Just cause it was SO worth it! There will be more detailed entries of our adventures in Fiji coming soon.